Location: Larne, County Antrim, Northern Ireland. Notes: Olderfleet Castle is a four-storey tower house, the remains of which stand on Curran Point to the south of Larne harbour in Larne, County Antrim, Northern Ireland. The place name of Olderfleet is a corruption of Ulfrecksfiord (or Ulfried's Fjord) the Viking name. 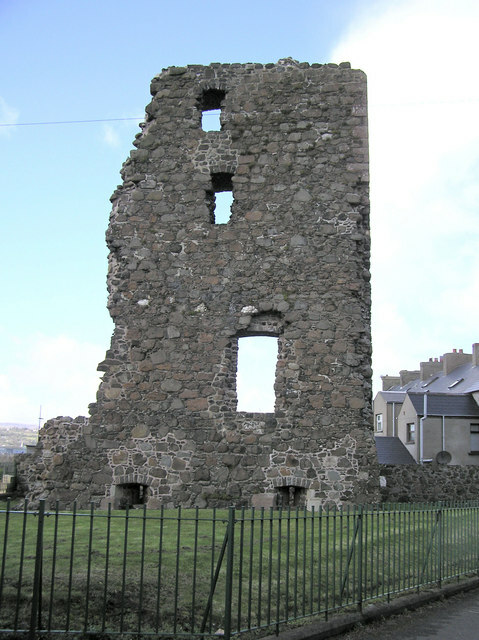 Olderfleet Castle is a State Care Historic Monument in the townland of Curran and Drumaliss, in Larne Borough Council area, at grid ref: D4133 0166.What remains of the four-storey tower house is part of the tower with pairs of gun loops in the basement. The square remains show that it only had 1 meter thick walls and it is without visible domestic features, which means that it could have been built as a fortified warehouse and watchtower.